Puma wants the shirt off your back, along with those toe-pinching high heels and last season’s too-tight skinny jeans. To reduce waste and keep discarded products out of the landfill, the sportswear giant has installed recycling bins in its stores in Germany to collect gently used shoes, clothing, and accessories—regardless of brand or origin. A collaboration with global recycling firm I:CO, the Bring Me Back program is part of a longer-term goal to develop a closed-cycle loop for the use of raw materials while giving castoffs new life in myriad forms. All donated items are sorted and graded through I:CO using over 400 criteria to leave no scrap unturned. Your unwanted denim may wind up as insulation for a home or automobile, for instance, or your old running shoes used to create a new race track. By reusing the items, upcycling them for industrial use, or repurposing the downgraded duds to create new ones, Puma seeks to mitigate the amount of virgin resources that would otherwise be exploited. The program will roll out to additional markets in October 2012, with a full global launch in January 2013. 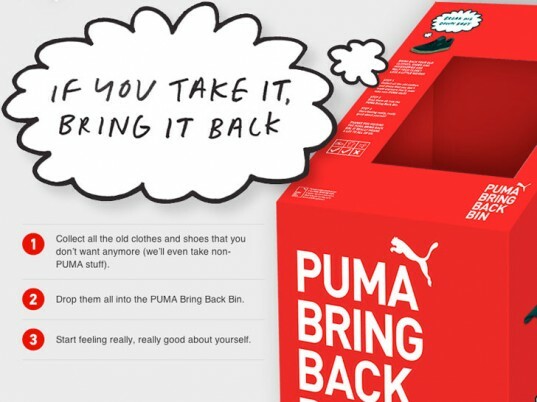 Bring Me Back bins are currently available in Puma stores and outlets throughout Germany, including Berlin, Düsseldorf, Munich, Hamburg, Augsburg, and Herzogenaurach. The program will roll out to additional markets in October 2012, with a full global launch in January 2013. Puma wants the shirt off your back, along with those toe-pinching high heels and last season's too-tight skinny jeans. 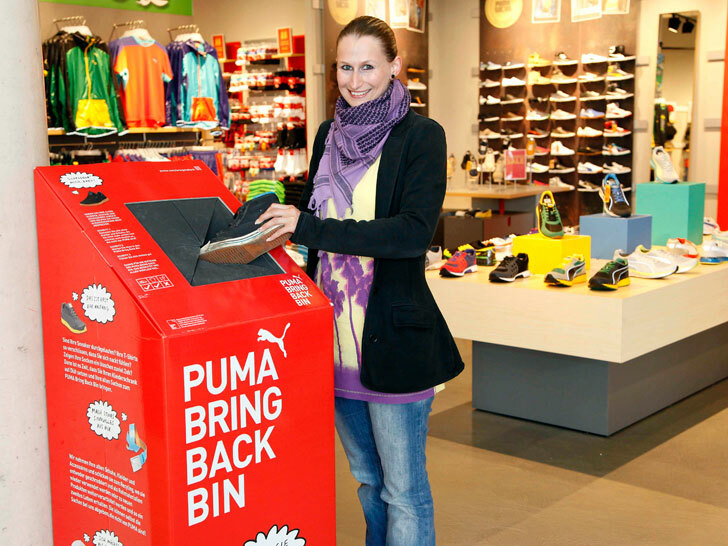 To reduce waste and keep discarded products out of the landfill, the sportswear giant has installed recycling bins in its stores in Germany to collect gently used shoes, clothing, and accessories�regardless of brand or origin. A collaboration with global recycling firm I:CO, the Bring Me Back program is part of a longer-term goal to develop a closed-cycle loop for the use of raw materials while giving castoffs new life in myriad forms.